The loose assemblage of paper and string Manu Prakash pulls fromhis pocket doesn’t look like much. And in a way, it’s not—just 20 cents’ worth of materialsyou can buy at an art supply store. But in another way, the Stanford bioengineer’s tangle of stuff is a minor miracle. Prakash calls it a Paperfuge, and like the piece of lab equipment it’s named for, the centrifuge, it can spin biological samples at thousands of revolutions per minute. That’s a critical step in the diagnosis of infections like malaria and HIV. But unlike a centrifuge, the Paperfuge doesn’t need electricity, complicated machinery, expensive replacement parts, or even much money to operate. There are a billion people on this planet who live with no electricity, no infrastructure, no roads, and they have the same kind of health care needs that you and I have, Prakash says. His lab developed the Paperfuge with these people in mind. Inspired by the design of a millennia-old toy, the Paperfuge is a hand-powered centrifuge made of paper, string, and plastic that can whip biological samples in circles at up to 125,000 rpm. Thats enough oomph to separate plasma from a blood sample (a standard diagnostic procedure) in 90 seconds. For reference, a StatSpin MP centrifuge—the kind of commercial centrifuge that youll find in diagnostic and research labs around the world—tops out at 15,800 rpm and can take up to two minutes to perform a plasma separation. Manu Prakash demonstrates how to use a Paperfuge, an ultra-affordable, hand-powered centrifuge made of paper and string.Prakash et al. Prakash is no stranger to innovative paper technology. In 2012 he unveiled the Foldscope, a folding paper microscope, inspired by origami, that costs less than dollar to produce and is powerful enough to see microorganisms. The tool embodied Prakash’s “frugal science” philosophy—the idea that access to affordable yet powerful equipment can have a profound impact on science and medicine around the globe. His labwasn’t the first to try to create a cheap, human-powered centrifuge. In 2008, researchers in George Whitesides lab at Harvard repurposed an egg beater to spin biological samples as fast as1,200 rpm. In 2011, researchers out of Rebecca-Richards Kortums lab at Rice University got anOXO salad spinner to hit600 rpm. Both options were bigger, heavier, more expensive, and far less effective than the Paperfuge. We wanted a much bigger jump, Prakash says. For us, it wasnt about finding the first thing that worked. It was about pushing the limit. We wanted an absolute solution. Prakashs team found that solution in toys. The best ones, he says—the ones that have stood the test of time—distill physical properties into approachable forms. Theres a sense of simplicity to their mechanisms that causes me to not only enjoy using them but thinking about them, Prakash says. His team started by experimenting with tops, but they didn’t spin fast enough or long enough to separate biological samples. The researchers tried yo-yos with some success, but the learning curve was way too steep. The problem is, you gotta know how to throw a yo-yo, Prakash says. And not just any throw. The best throw. Consistently. And ideally, you have to be able to set the yo-yo-spinning again without it returning to your hand. (This is called looping, and it looks very, very hard.) Even after more than a year of practice, Prakash says hes never been able to beat the lab record of 4,000 rpm—set by a visiting researcher, a former circus performer and yo-yo master. Its a simple design, so one night, I made one myself. My girlfriend lent me a thread from her sewing kit and I strung it through a button, Bhamla says. He positioned the toy in front of a high speed camera and started spinning. Later, when I analyzed the footage, I realized that the button was spinning between 10,000 and 15,000 rpms. I remember feeling that this was it, this was what wed been looking for. Bhamla knew that if he understood the whirligigs mechanics he could optimize it for speed. But when he searched for whether anybody had ever modeled whirligig dynamics, he found only basic simulations. That was a beautiful paper, Prakash says, but the authors werent thinking about the toys fundamental limits. The papers mathematical models, in other words, were too simple for their purposes. We wanted to understand the entire design space of the toy. Still images of a rotating paperfuge captured with a high-speed camera. The images show the string in a wound, unwound, and rewound state. The insets highlight a phenomenon called supercoiling, whereby the string becomes so tightly wound that it coils over on itself. Creating a coil or coils. 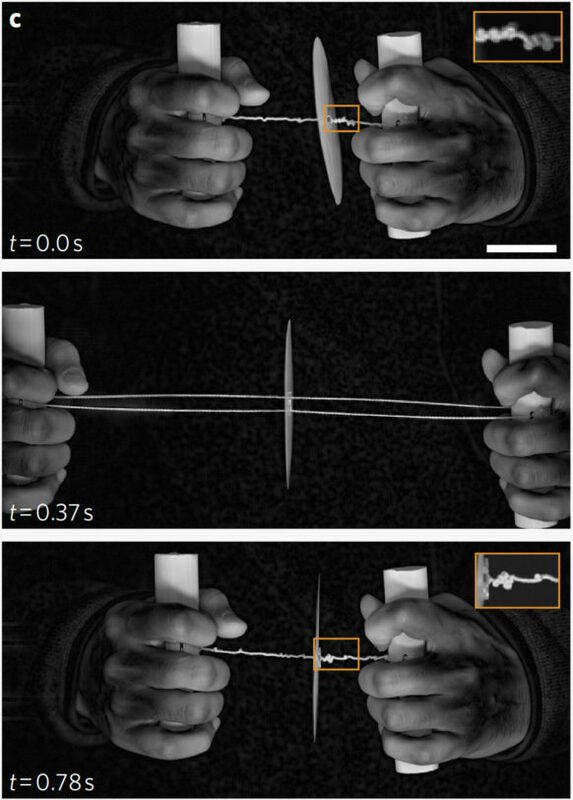 A supercoiled string stores more energy, which helps accelerate the disc to higher and higher rpms.Prakash et al. The team spent the next few months studying the complexities of the whirligig system and converting them into a theoretical model, the details of which they recount in the latest issue of the journal Nature Biomedical Engineering. They discovered that much of the toys power hinges on a phenomenon called supercoiling. When the string coils beyond a certain threshold, it starts to form another coil on top of itself. (You can reproduce this phenomenon yourself by twisting your shoelace, or a length of telephone cord.) A supercoiled string stores more energy, which helps accelerate the disc to higher and higher rpms. The researchers used this and other observationsto simulate a wide range of whirligigs. Physical prototypes came next. They tweaked the length of the string and the radius of the disc, and tried a variety of materials, from balsa woodto acrylics. In the end, though, the group settled on the same stuff Prakash used to build his Foldscopes. Its synthetic paper, the same thing many countries use in their currency, Prakash says. It has polymer films on both front and back that make it waterproof, and its incredibly strong, as well. Plus, they still had plenty of the stuff lying around. Now people are just starting to get access to Paperfuges. This is a great example of how extremely creative people can originate important new ideas by relaxing and observing the world around them, says Ray Baughman, Director of the NanoTech Institute at the University of Texas in Dallas, who was unaffiliated with the research. (His lab figured out that you can build artificial muscles by supercoilingfishing line like the strings on the Paperfuge.) And the application of the described technology for resource-limited parts of the world might provide enormous human health benefits.